I met Marcel Wanders! Yes! But first, let me explain how and why. It’s all about my collaboration with Alessi and his latest Five Seasons collection with them… Ready to learn more? Iconic Italian brand, Alessi, has produced everyday designer objects since 1921. In fact, most of us have a few products from them in our home, most likely the kitchen. They frequently partner with some of the best designers in the world and I just had the honor of visiting their showroom during Milan Design Week and mingled with one of their brightest stars, legendary Dutch designer Marcel Wanders. Together, they’ve launched the Five Seasons collection composed of 5 fragrances based on the four seasons plus a mysterious, sensual and spiritual 5th season, all for the home. Best of all, I was at the launch party and was able to experience the seasons, and Marcel, up close and personal. With room perfume, candles, and diffusers, this collection will appeal to design fans because the fragrances are sophisticated, unique and the overall design is mostly clean, sophisticated and will fit any décor. You won’t find the typical scents in this collection; instead imagine a candle with subtle notes of bergamot, lily of the valley and musk. The diffusers, which usually are seen on the market with typical reeds, are much different in Five Seasons. Instead of generic reeds, stylized leaves were designed from mahogany, making the design fresh and unique. These elegant leaves make the diffusers more of a décor accessory as much as a practical, functional room fragrance. Each of the five scents has its own stylized leaf paired with a different fragrance in the collection. 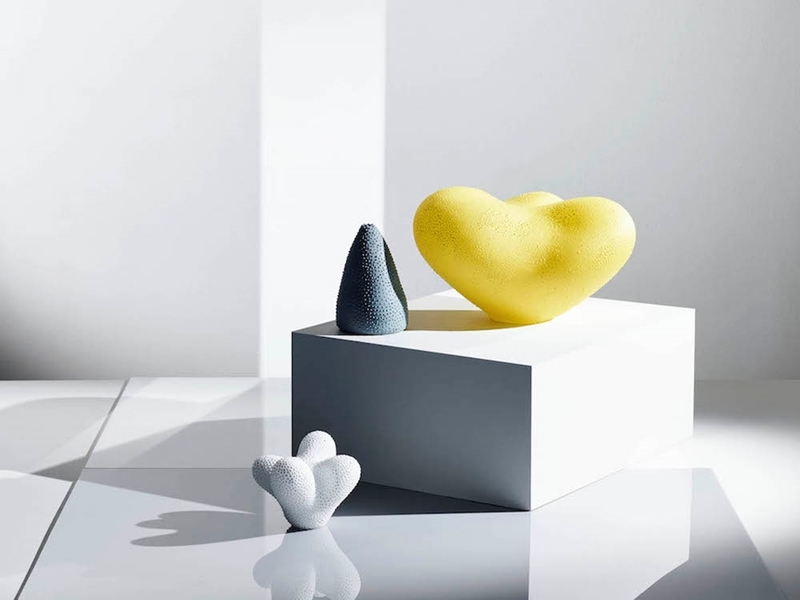 The 5th fragrance is also paired with a natural lava stone that subtly diffuses the perfume into the room. In addition to the overall design, I liked the fragrance and product itself because you can imagine the collection appealing to anyone, regardless of gender, age or even cultural background. The collection doesn’t feel overly masculine or feminine, which I love because so many companies producing fragrance today tend to target women, yet many men also love a home that smells appealing to them and not the typical flower or fruit scents often found when you’re shopping for room fragrances, candles, and diffusers. The porcelain bases of the diffusers and candles can be selected in black or white and the fragrances are definitely gender neutral. BRRR: Notes of bergamot, lily of the valley and musk. Fresh, sparkling atmosphere, reawakening the senses. AHHH: Youthful, grassy, delicate notes like cardamom, hyacinth, and vetiver. HMM: Red berries, fig and woody notes. Clean and elegant. GRRR: Incense, cedarwood, and moss. Sensual, complex, smoky notes. SHHH: Eucalyptus, rose and patchouli. Intrigue, a mysterious bouquet. While perusing the Alessi showroom in Milan, lifting each glass dome to experience one of the five seasons, I was focused on selecting my personal favorite. Which one was it, you may wonder? Definitely AHHH (shown below) because it was fresh and pure and I would love this scent in my bathroom while relaxing in the tub with some wine and good music. I can't forget the famous Marcel Wanders! I’ve wanted to meet for twelve years, ever since discovering his work while I was still in design school. I’ve long loved how he marries traditional Dutch design with futuristic shapes and modern design, showing the true talent of Mr. Wanders to be so diverse, fresh and a true leader in his field. I've also long admired his playful sense-of-humor and sparkle, which was so apparent when we met - he is absolutely charming and full of life, which translates into his work – including this collection of fragrances. As you can see, I was all smiles during this special event and am so proud of Marcel's continued success and his contributions throughout the years to the design industry overall - such a mega inspiration to so many! Did I mention a party with cocktails were involved? Each of the 5 cocktails served were designed to ‘match’ each of the fragrances. I wish I had taken a photo of each of them – it was such a gorgeous idea to imagine how a fragrance would taste and look if translated into a refreshing drink. Fantastic idea. I also ran into some friends, made new ones, and had a beautiful evening in the warm and summer-y courtyard with Marcel and the many friends who came out to support his launch. Here are a few snaps from my iPhone. No evening is complete without a selfie and a shot of the floors, which were very cool and looked great with my silver loafers. My evening in Milan with Marcel and the whole Alessi team was a true pleasure and an honor. I’m happy that I was able to experience his collection and also, his big, open and vibrant personality. All in all, a great collection and a gorgeous evening well spent. We're Off To Milan! See You Again On April 23rd! Hello friends of decor8! I am heading to Milan first thing in the morning, and a few of your decor8 columnists will be there too for Design Week and the Salone del Mobile. In fact, I'm working alongside Mary Middleton and Agata Dimmich at the fair on Thursday to cover a bunch of Italian brands, so follow my Instagram to see more @decor8. I'll also be working on a special assignment along with some smaller projects, too. It promises to be a very productive week! There's a lot happening, and I can't wait. The most exciting part though is to see my friends and colleagues and mingle in a beautiful city like Milan that is so vibrant and full of sunshine, great food, and nice people. Have a fantastic week everyone! You can catch me blogging here again with my team on 23rd of April with lots to share from Milan, but in the meantime, I'll be sharing my inspirations from Milan through Instagram Stories and Insta photos all week, so please follow me @decor8 to be a part of the fun. 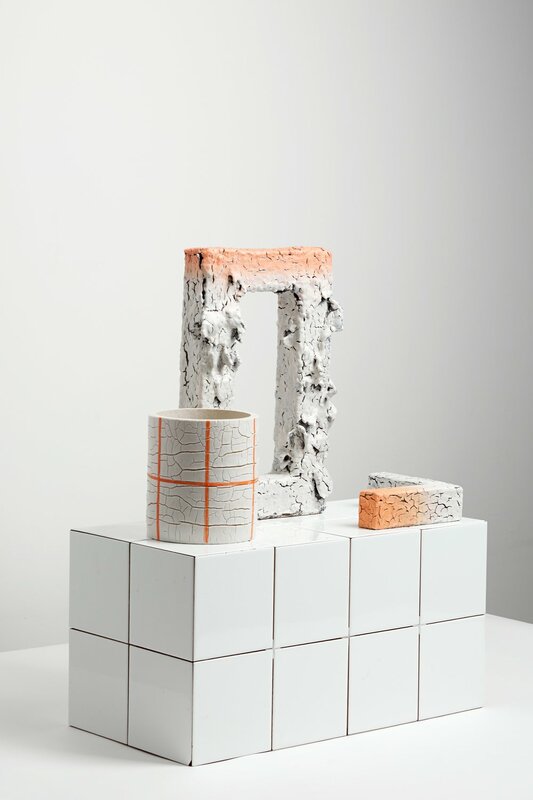 Collect, the Craft Council’s annual fair, was established to showcase the premium end of contemporary craft, from museum-quality pieces in ceramic, glass and wood to conceptual installations. Collect filled the entire Saatchi Gallery for its fourteenth edition, where the Crafts Council gathered 40 of the most prestigious galleries together to show more than 400 artists, from 13 countries around the world. It was a celebration of making, in all its disciplines. And talking of museum-quality, the V&A were actually at the show purchasing for their collections. When the weather is cold, don’t we all just want to cozy up and look at something pretty? 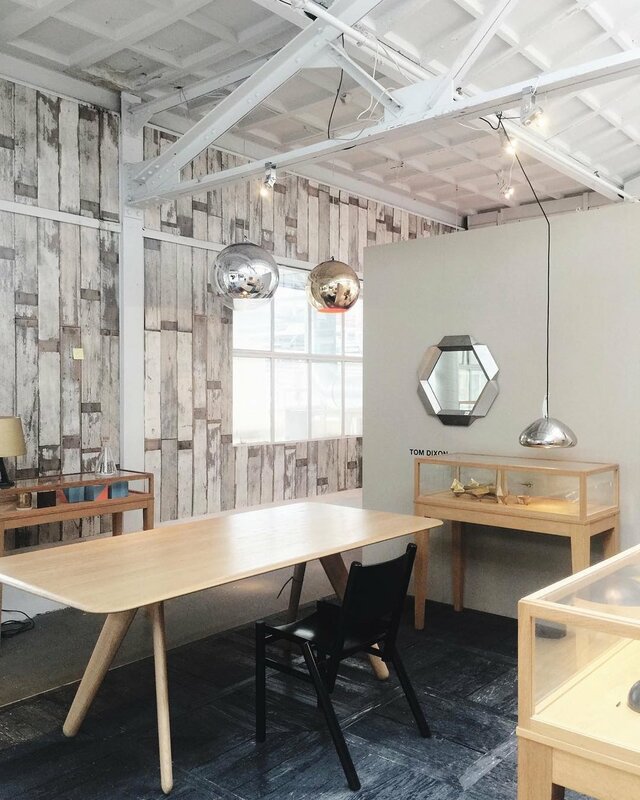 Today I have 12 favorite finds from my recent visit to Collect, and I can't wait to share them with you. This is Mary and I’m back on decor8 today with more inspiration for you from the UK. I’m not much of a crafter myself, I think it must have skipped a generation as my Mom and my Grandmother were avid knitters and makers. Not me though, I’m quite hopeless. A recent Craft Council survey found that 25-44 is the fastest growing age range of amateur crafters, from knitting clubs to spoon carving. It's not just a homegrown phenomenon though as there is a rise in professional designer-makers too. Maybe it’s a response to our increasingly digital lives. Maybe it is the need to do something physical with our hands. Whatever is at the heart of its increase, I think it’s great to see so much talent and creativity on display. The sheer breadth of work is impressive at Collect, and there was so much that I really liked. To keep it simple, I’m going to share the 12 pieces that captured my attention. 1// This year, designer Jay Osgerby and the Crafts Council team selected 14 makers from across the craft spectrum for Collect Open. One of those selected was Forest + Found who created their largest installations to date. 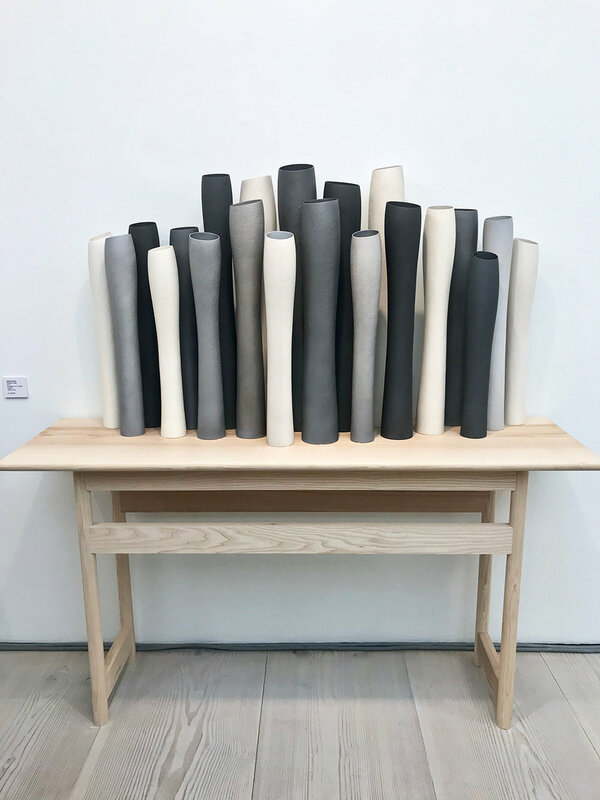 Max Bainbridge and Abigail Booth who make up Forest + Found work with wood, natural pigments and textiles to produce sculptural and wall-based works. Their installation The Between explored the way humans interact with made objects. 2// I first saw the work of Vezzini & Chen at the Future Heritage exhibition at Decorex in 2016. Cristina Vezzini specializes in handcrafted ceramics, and Stan Chen is a glassblower. They bring both disciplines together to make incredible objects, with my favorites being their lighting pieces. A highlight of the Ting-Ying Gallery booth. 3// Louis Thompson, represented by the London Glassblowing Gallery, is a highly regarded artist working in glass. His artworks can be found in museum collections in Japan, Germany and the USA. What I loved about his textured pieces was the overwhelming desire to touch them. Full of bumps and curves and reminiscent of colorful alien-like sea creatures, they had a bold yet playful feel to them. I imagine they’d look fantastic styled in a little tabletop vignette. Desire by Louis Thompson represented by London Glassblowing and Vessel Gallery. Photography: Jake Curtis. Art direction: Hana Al Sayed. Via Zetteler. 4// Another watery, colorful and otherworldly example of gorgeous glass work. Glass artist Tim Rawlison (also with the London Glassblowing Gallery) uses two different processes that distort the layers of color within the blown glass components, giving the illusion of ink dispersed in water. This was one of the pieces that I would happily have walked away from the Fair with, if money were no object, of course. 5// Laura Hart is inspired by a love of flowers, particularly orchids. Her sculptural flower collections are breathtaking in their detail, particularly when displayed in a large group as they were on the stand of Vessel Gallery who represent her. 6// Jo Taylor’s colorful Pride & Joy series was inspired by the Pride badge worn by someone close to her. Jo’s work made me smile as soon as I saw it because it was vivid, bold and saturated in color. The relationship between the six colors is fascinating but ultimately happy. Jo is part of the Young Master program at Cynthia Corbett Gallery. 7 // Jan Hendzel exhibited a collection of furniture and vessels for Collect Open, using both digital techniques and traditional woodworking methods to explore "what lies beneath" the materials. 8 // Seeing a “domestic” table scaled to 2.5m long and 1.1m tall is slightly disconcerting. Table by metal-smith Juliette Bigley is an installation of 20 unique tabletop vessels including a wine bottle, a jug, and water glasses, crafted from a mixture of patinated copper, brass, nickel silver and silver. There is something so familiar and routine about it, yet utterly throws you off balance. Beautiful and discombobulating at the same time. 9 // The Cynthia Corbett Gallery showcased the work of the nominees and winners from the Young Masters Art Prize. Showing a variety of work from artists such as Matt Smith, Alissa Volshkova, Alice Couttoupes and Tessa Eastman. Drawing inspiration from the Old Masters either through technique, imagery or subject these artists are creating unique contemporary work. 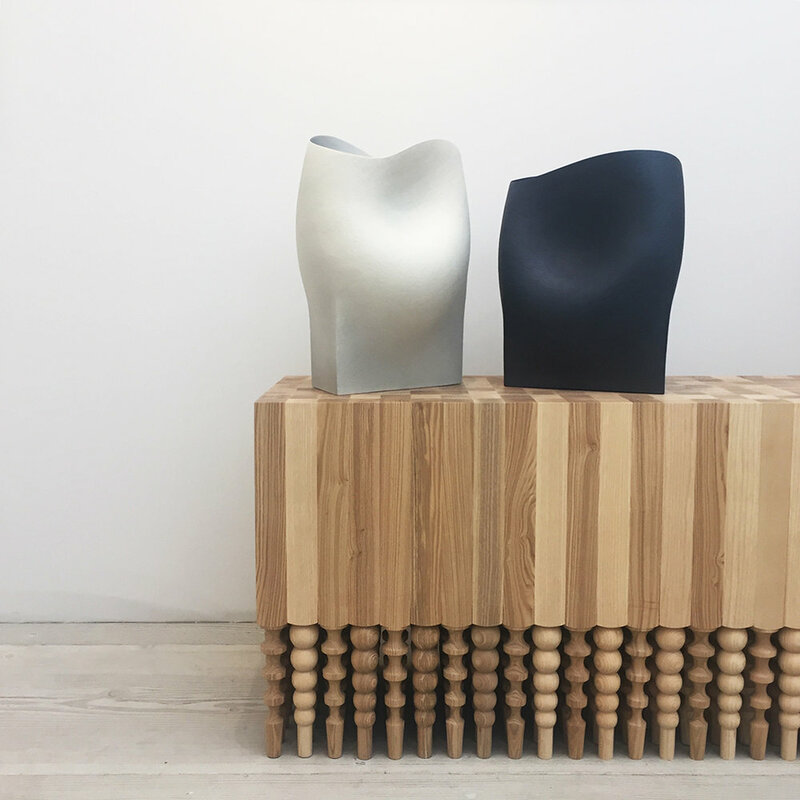 10// As one of the finalists for the LOEWE Craft Prize, Irina Razumovskaya represented by Officine Saffi was on my must-see list at Collect. 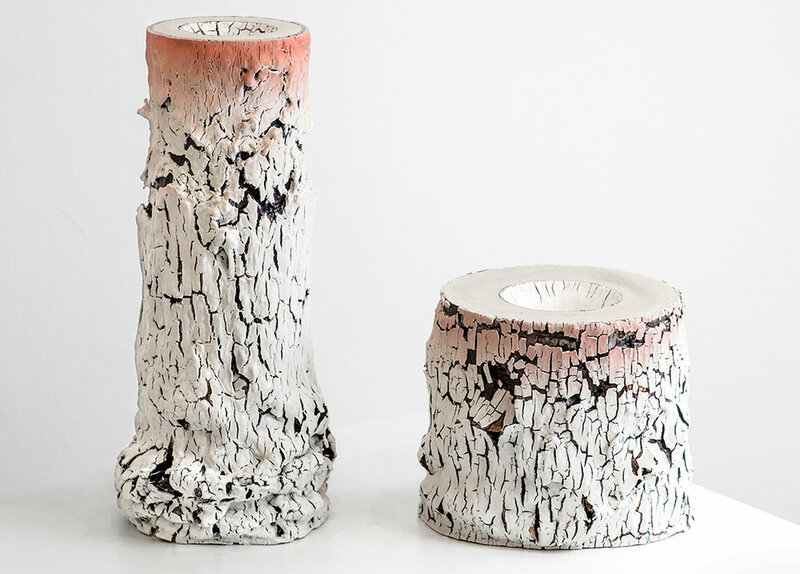 Inspired by tree bark, peeling paint and aging materials, this inspiration is very apparent in her Post-Surface series. The texture gives a sense of natural degradation and age, which is fascinating especially combined with a warm pink color. Irina fires her pieces 5-8 times until the layers peel to get the desired effect. 11 // Represented by Cavaliero Finn, Egyptian-born British ceramicist Ashraf Hanna signature muted palette pulled me in to take a closer look at his Petrified Forest installation. Then I spotted his voluminous Undulating Vessels that he is so well known for, and they were sitting on top of the Galvin Brothers Battalion Spook Wood... Wow! 12 // An exercise in wood-turning, Spook Wood is a capsule collection of furniture made from hand-turned spindles in their East Yorkshire workshop and can be made to order in various shapes and sizes. Spook Wood is represented by Cavaliero Finn. So what do you think? Do any of these capture your imagination? Would you want to make a little space for them in your home? These are future antiques after all. Sometimes I find at shows like this, it isn’t necessarily about coveting the piece directly but about being inspired by the shape, material or color and wanting to bring those elements into our homes. Hopefully see you again soon with my finds from an exhibition. Hello everyone. I was recently at Formland in Herning, Denmark for the first time and so I wanted to tell you all about it because it was just great! I was invited as a special guest to give the opening speech along with two lectures, one on trends for 2018 and the other on the unexpected health benefits of good design. I had a great time and I will definitely return again someday, for sure. At Formland, you can expect to see the latest trends and tendencies within Scandinavian design today and in the near future. The fair has been around for 34 years with a total of over 67 fairs so far. I can see why people attend this fair, it was certainly special. It was large enough to feel fun to explore, but small enough to not feel exhausted, overwhelmed or like you had to spend hours digging to get to the pearls - it was quite easy to find beautiful things, fast. It had, by far, one of the best trend presentations that I've ever seen at a fair. This was a big shock, I wasn't expecting it, but it's the truth. It was so well organized, huge, beautiful and also educational and valuable. I could have spent half a day in the trend zones created by the talented duo STUDIE FLYHELSTED. I would return to this fair JUST for the trend zones by these two ladies - they were really THAT good. I loved the curated hall by Danish interiors celebrity, Mads Arlien-Søborg. This was the hall I stayed in the most during day two. There wasn't one booth in the entire hall that I disliked, everything was gorgeous and so well presented. I really like the idea of having a tastemaker curate an entire hall at a fair. Why aren't more fairs doing this? I want to curate a hall at a fair - would be exciting! I really liked the food hall. It was great to have a good hall to begin with, because you could walk around and sample things and meet people and the vibe was really open and friendly. I also liked knowing that when I ran out of energy, I could go to the food hall and find chocolate or something to munch on. Speaking of food from point 4, the food at the actual fair was delicious. Each hall had it's own cafe and some, a few different things like a cafe and a food truck, or a food truck and a non-alcoholic bar... In any case, it was so well done and everything was fresh and delicious. I had a very healthy avocado salad loaded with other delicious things and it gave me the perfect energy boost. Most of the time, fairs have terrible food or very unhealthy things - Formland thought of everything! They even had a MICHELIN STAR Asian food truck - HELLO. Have you ever seen THAT on offer at a fair? This was such a highlight for me personally. I loved how friendly the exhibitors were, and how they invited people who were using Instagram or bloggers to take as many photos as desired and they even told people to rearrange products and style things as they wish for photos, it was quite amazing really - there wasn't a single booth with a "NO PHOTOGRAPHY" sign, everyone was open and invited and encouraged photography, conversation, styling, anything! I really liked the new talents section, it was so lovely to meet the many exhibitors there who were eager to show us what they are producing. Their passion was very contagious and I liked strolling around there meeting everyone. I got the sense that all of the exhibitors were really trying to help each other too. Many times, a stand would suggest another exhibitor there I should check out, or would walk me over to their friend who was selling this or that product. There was a great community spirit at this fair but especially in the New Talents Section and in the Curated Hall by Mads Arlien-Søborg. This was the coolest presentation I've seen yet at a fair - an entire hallway dedicated to tastemakers and influencers whom the fair invited to take part in showcasing favorites from the fair. They had everyone from the Editor-in-Chief of Bo Bodre, Charlotte Ravnholt, to others considered tastemakers in Denmark and also me, as an online influencer and trend expert. This was such a great use of an otherwise boring hallway between halls! Instead, it was filled with things we'd handpicked - was great! This was another unexpected treat - a local florist, Bloom, on site! And after they make an arrangement for you, they kept it all day with your name on it so you could return at the end of the fair and have something inspiring to bring home with you. This was great. What I didn't expect was that a smaller, more focused fair like Formland gives you an incredible chance to MEET great people. I really connected with people - exhibitors, magazine editors, sales agents, trend experts, all of them. I also got to connect with those whom I know already and care about, like my new friend Stefan from TrendStefan in Stockholm. Here were are below clowning around a bit after we were both interviewed on camera by the fair. Will I go back to this fair? ABSOLUTELY. I loved their new format, how they've taken the fair to new heights, and I felt the fair was inspiring and felt fresh. Thank you Formland for having me as your opening speaker (a mini clip of me speaking here with an audience of 300) and for being so kind in welcoming me to give two trend lectures, too. I loved being there and will always remember it as a great time and one of the friendliest fairs I've ever been too. Hi decor8 readers, I’m Mary and I am delighted to be part of decor8 team as a foreign correspondent. For the trade shows Holly cannot attend, I’ll be bringing you news from these shows and locations across Europe. Holly and I both have young boys, which makes it impossible to be on the road attending every fair out there, so she wanted to hire on someone like me who can visit fairs she can't, because decor8 is more and more becoming a source for readers to find the latest trends in Europe - and so together with Holly, we want to continue bringing those to you. I sometimes refer to myself as a trade show veteran, and I’m not referring to my age! I’ve been reporting and trend hunting for more than 10 years at trade shows across Europe, with Maison & Objet Paris being the first I ever visited outside of the UK. I do, in fact love interiors fairs. There is a thrill I get from spotting something new, unique or particularly well crafted. I’m a fan of color, form and function and get very excited if I come across all three in a product. I love meeting the faces behind the brands and hearing them share their passion for the products they create and produce. Trade shows are also remarkable places to network and geek out with fellow like-minded design lovers. Just last week I was at Maison & Objet in Paris for their January edition of the trade show. If you’ve never heard of it, or been, it’s BIG. With over 3,000 exhibitors showcasing the latest international home wares, furniture, accessories, and lighting in 8 halls. It’s easy to clock up double-digit miles walking through the aisles. Having a plan and knowing where to look to find the kind of products you’re after is essential at trade shows this large, but I always like to go a little off-piste to find new things. The design influences I think we are going to be seeing more of in 2018 are; Rich earthy and berry colors, more velvet, curved shapes, cane work and rattan and monochrome being the new minimalism. So with that in mind, I’m going to share with you some of my favorite finds from this edition of the show. Some of them you may well have spotted already on social media and others will be filling the pages of magazines by this summer. CC-Tapis is an Italian company, which produces contemporary hand-knotted and hand-woven rugs which are created in Nepal by expert Tibetan artisans. Known for it’s contemporary design and fashion-forward color they’ve collaborated with design luminaries such as Patricia Urquiola as well as many up and coming designers. They always deliver a knockout stand that’s like a warm hug of color. The newest releases for 2018 are predominately soft toned representing the new neutrals, which are extremely calming and utterly feminine. I’m a big fan of the “face” as it reminds me of the Miller Goodman Faces blocks. Casalto is referred to as the Interior Jeweler by its mastermind, Architect Eric Willemart. That alone was enough to stop me in my tracks and ask a few questions. It’s more like a mix and match configuration game, than a traditional home furniture and accessory line. 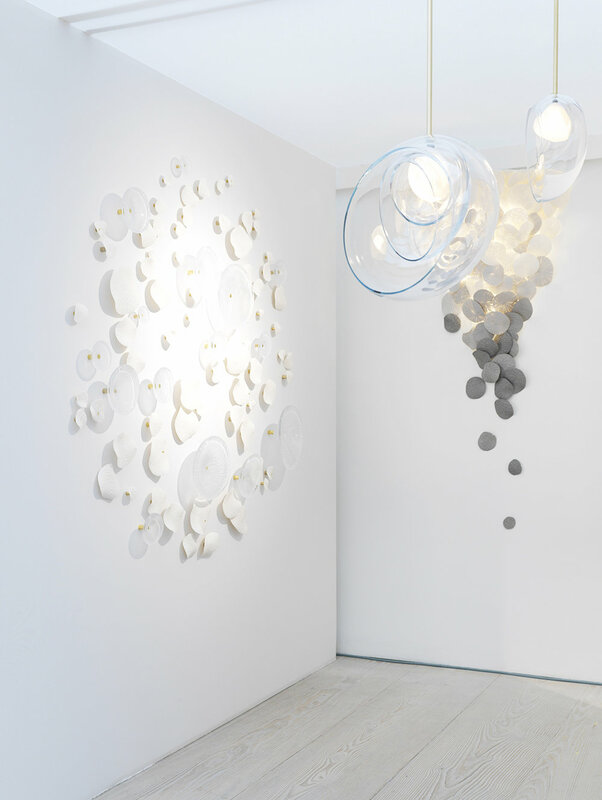 Made up of 27 individual pieces shaped like cones, cylinders and disks they can be combined in a number of ways to make unique pieces for your home – tables, lights and vases for example. What was so impressive was that each element is handcrafted and it’s so striking in black and white with metallic accents. Completely new to me and a really fun concept. Italian ceramicist Rina Menardi is always a must visit stand, as her vast collection of elegantly shaped and colored ceramics are all inspired by nature. The color palette is always so beautiful, the baked stoneware incredibly tactile and the shapes are incredibly versatile. I’d love to own one but with a small child, I might have to wait a few years. I have a soft spot for Danish brand Woud, mostly because it’s so easy to live with. Holly has written about them here from her visit to IMM last year, and she had used their chairs in the decor8 booth that she designed for the fair. Each time I see them at a trade show they are never shy with color and seem to be masters at color blocking. They excel at wall hanging storage/shelves but it’s their cute little wooden animals that without a doubt melt my heart. Eno Studio always creates at least one item that catches my magpie eye, when I’m stomping through the halls of Maison & Objet. This spring edition was no exception. Not only are they clever with color; they also have a fine tuned radar for alluring finishes – think warm metals and lush jewel toned velvet. 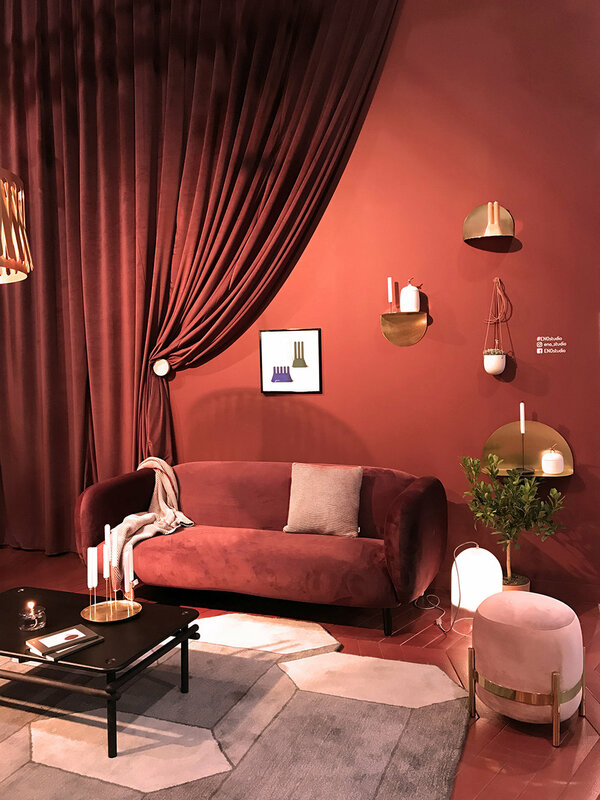 I loved the abundance of deep red hues and dusky pinks and the Vega pouf in the brass finish was definitely on my lust list. It was impossible to miss the organic, ethnic-inspired trend of cane, wicker, rattan, straw, and raffia that has developed from the Boho and 70’s trend across the halls of Maison & Objet. Dutch based Ay Illuminate were one of my favorites; inspired by nature and different cultures, they use natural waste materials to produce their collections. Their Buri range of pendants and baskets are made of palm leaves utilizing local handicraft expertise in Asia. Jo Ham is the creator of Ham, which was born in 2011. A design led homewares and paper goods range following the incredibly cute life of a contented rabbit on his daily adventures. The range of prints, mugs, cards, wall stickers and pins have featured in Paris’ Collette store and in Vitra’s advertising campaign for Ronan and Erwan Bouroullec’s Corniches wall shelves. I’ll also happily admit to having a Ham bunny myself. There are understandable a lot of French companies that exhibit at Maison & Objet, one that is particularly playful and gathering a bit of a following is Petite Friture. I really liked their new black and white wallpaper by illustrator Lisa Laubreaux, which to me evoked the artist Keith Haring. Sklo designs and manufactures hand blown Czech glass. 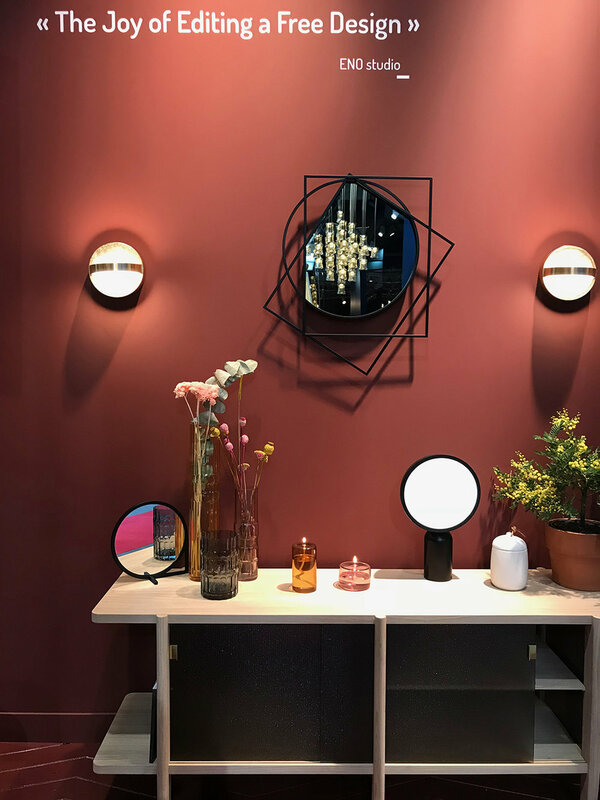 With a gorgeous range of lighting and accessories, they unveiled new colors of their WRAP collection. These hand-blown tubes are turned into effortless knots by Sklo craftsman and look amazing on top of a stack of books or styled in a table vignette. The new opaque colors of celadon green and apricot and the new clear version turquoise were my favorites. Not strictly at Maison & Objet as they were showing in the center of Paris, but Vitra had an accessories showcase at their new store which was impeccable styled. The peach wall with Alexander Girard Metal wall reliefs was an absolute delight and it’s a color I think we’ll be seeing more of in 2018. From the new collection I was particularly taken with the new Trays and High Tray by Jasper Morrison simply because a shot of color is always a good thing in my book. What do you think? Any favorites? I came back with lots of inspiration and a “little” list of things that I covet. See you soon again with fair coverage and other finds, nice to be here! - Mary. I can't wait to tell you about Piet Hein Eek but first, a little story so you can better understand my connection to Piet and his work. I've had the pleasure and privilege during the span of 12 years in the design industry to meet and see some of the most inspiring people and places. I consistently feel lucky to have these experiences and despite how some may begin to feel comfortable doing so many fancy things, even expect them, I remain grounded and always fight against my "ego" - I guess it's something I learned from my father. No matter how high he climbed in his career, he still ate lunch with the guys in the trenches, who worked in the "guts" of the company, and he always helped people in need, and gave jobs to those who worked hard and were intelligent, not to his friends or to people who just looked great on paper. I liked his personality and respected him so much for this. I remember how actively he worked to hire minorities and how angry he'd get when someone would look down on race, gender or sexual orientation. He believed and valued equality and human rights, and felt everyone was the same and that there are no differences, just different personalities. Today, despite how I exist within an industry that can sometimes be all about brands and names and prominence, I still somehow find others like me who are grounded and "normal" in spite of their enormous success and blessings in life. I am drawn to talent, personality, and people that possess a keen emotional intelligence. However, they need to have a keen business sense too and be very strong-minded who are true pioneers and go-getters. To me, these types of people are really the most captivating and make me feel inspired and excited. One person who stands out in the design world is Dutch designer Piet Hein Eek. You may or may not know him. If you are American, most likely you aren't so familiar as maybe you are with Kelly Wearstler or Jonathan Adler. But in Europe, he is known if you are in the design world. Piet is rather iconic even and has achieved quite a lot at such a young age - he only recently crossed over into this 50s, yet has so much success and status it's inspiring, really. Piet studied at the Dutch Design Academy in Eindhoven and his graduation project, nearly 30 years ago, was a scrapwood cabinet. Today, you can find this cabinet in his work "compound" (shown throughout this story) and the cabinet travels with him to trade fairs - because it tells his story as a student who started with a love of recycling, making something new, and using wood - a material he clearly loves most. Piet is an artist at heart, I could see that I explored his multiple spaces at the Piet Hein Eek factory. As you enter the space, you can see all of the "scrap" art Piet has created throughout the years. In fact, in Eindhoven, you can visit a very special space too - in fact, I encourage you to go to Eindhoven JUST to see this space because it's worth spending a day there - the Piet Hein Eek Factory and Store. On location, there is a large cafe with delicious food, his factory in the center where everything is made from furniture to custom jobs for clients, a concept store on two floors, workshops you can attend, a special art space on the top floor, and a few other areas for pop-up shops and dining (those open full swing during Dutch Design Week each October when the whole city visit Piet to see the artists and designers he's welcomed to his massive space to show their work). In the next few years, if all goes according to plan, Piet will create an on-site boutique design hotel. For now though, you can rent his gorgeous guest homes in France here. Nard from Piet Hein Eek's team, giving us a tour of the space including the factory and "behind-the-scenes spaces. I took a tour and spent time with Piet to get to know him better and he's quite nice and easy going, while also being very much a "boss" and a go-getter. We had a meal together. I met his wife and one of his lovely daughters. At Piet Hein Eek, it's a family first business in spite of how busy he is. You can see he cares about his family (they work with him) and his employees, in fact he treats his hired staff like family. I liked watching him interact with his staff, there was this genuine admiration and respect, a "dad" that everyone ultimately looks up to. When it comes to design, I admire how quickly he spots something and can spin it into so much more - he has a clever eye and that eye has brought him into the world of ceramic making, building and space design, metalwork, art installations, and the making of beautiful, custom lighting too in which he takes vintage pieces and modern elements to create pendants, table lights, and chandeliers. My favorite lighting that he has created is a collaboration between Piet and Veronese, I just adore this collection of Murano glass lights which range from small to massive. Throughout this post, you can see some impressions of his factory and the space around it - to get a better sense of how massive it is. Also, he has recently teamed up with IKEA to create a line for them, you can find more on that here and see the products here. If you follow me on Instagram @decor8, I'm sure you saw lots of Piet Hein Eek and his store while I was there a few months ago. If not, here are some more iPhone photos for you to enjoy below to get a sense of the space. Thank you Piet for your conversation, dinner, your book and the welcome you gave me. I'll never forget it.